One question that might occur to Fotograf Gallery visitors prior to their arrival to see the Black Light exhibit might be why are we showing sculptures in a photo gallery. 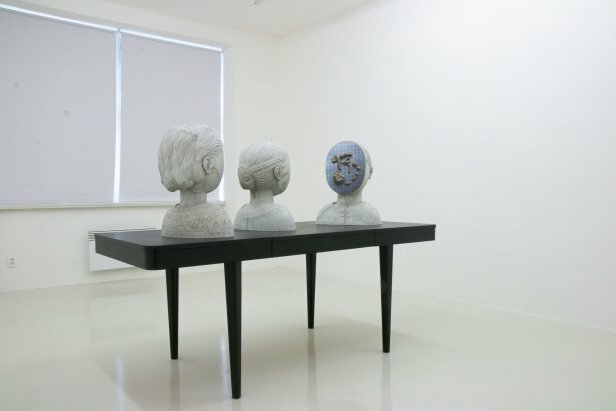 Anna Hulačová (1984) is an artist who openly builds on the beginnings of classical sculpture. 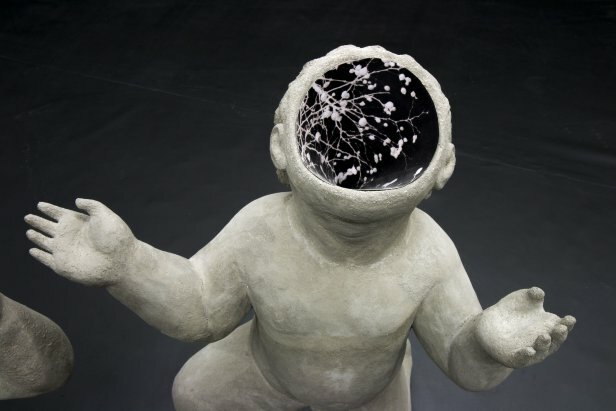 She creates busts and figurative sculptures and plastic forms. She uses the spectrum of traditional sculpting materials and refers freely to sculptural history. So if the question posed is grounded in feelings of a certain inappropriateness, a further question pertaining to the logic of collaboration between a sculptor and an artist, considered to be a „thorough analyst of the film image“, might have a similar motivation (D. Zahoranský). The answer to the second question is simpler. All you need to do is look more closely at Victor Takáč’s (1982) work and admit that it relates more to sculpture than it might seem at first glance. Mr. Takáč is generally interested in the parameters of film works, as well as the „projection situation“; i.e. the set of conditions that surround the actual showing of the film. So at exhibitions (sculpture) does not relate to film only at the relevant immaterial level, but also through the physical adjustments to the space that the projection impacts. Here he is already acting like a sculptor; perhaps as the sort of sculptor who has a greater affinity for spatial intervention and its intentional (reasoned) restructuring. He does this in lieu of creating classic three-dimensional sculptures. 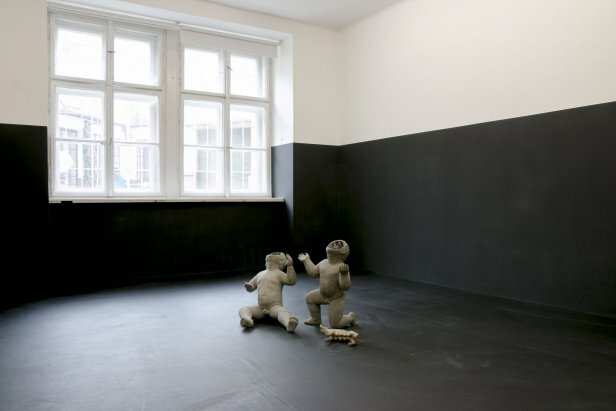 His artist-curator role in the exhibition, Non-objective film, at Brno’s U Dobrého pastýře Gallery holds a special place among his activities to date. There, through sculpturearchitectural added constructions, he changed the form and meaning of movable „light images“ (M. Kupková) by five other young artists. It also makes sense to mention Non-objective film due to its similarity to Black Light. Both exhibitions are similar in the way that Takáč works with other works of art. In Fotograf Gallery as well Takáč, per mutual agreement, „borrows“ Anna Hulačová’s plastic forms and creates a new milieu for them. This time the central inspiration for both artists was photography. 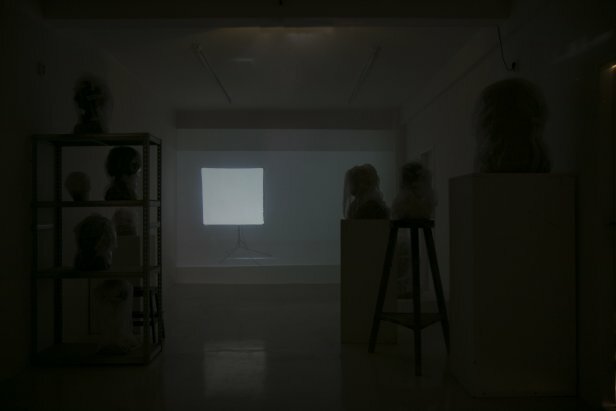 „Black Light“ as a photographic effect, where the object in the fore stands out on a dark background, or a reference to the photographer’s darkroom and the illuminating flickers of the photographer’s flash, determine the basic principles for placing the sculptures in the gallery space. The black-and-whiteness of the entire installation refers both to the specific „gift“ with which photography, and somewhat later, early film enriched our visual imagination, as well the general polarities that Black Light must pass through: between mass and its content articulation, its presence and absence, visibility and invisibility, transparency and opacity, facedown and face-up, etc. 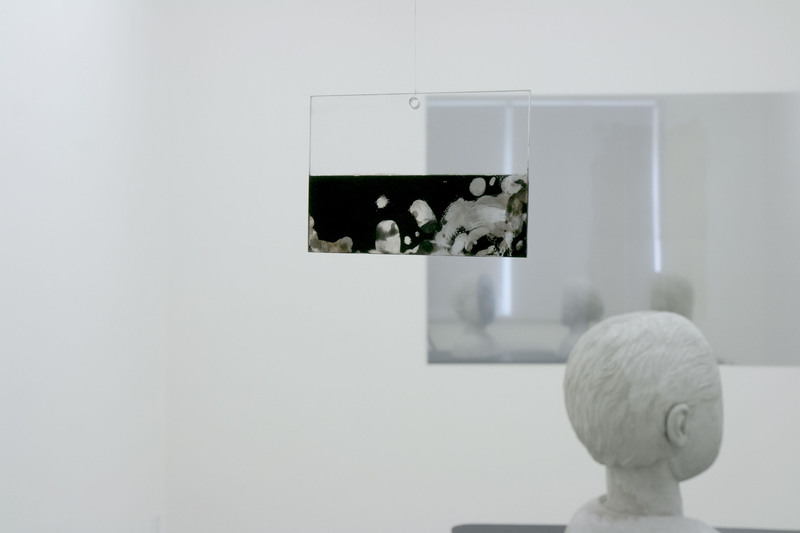 Takáč relates to the mass and inherent symbolism of Anna Hulačová’s plastic forms and surrounds them with abstract elements. Photographic principles find themselves in the role of tools that allow one to act; for not only do they make specific vision (framing) of reality present, but they also provoke broader associative and metaphorical resonance that is bound to black and white and light and dark. 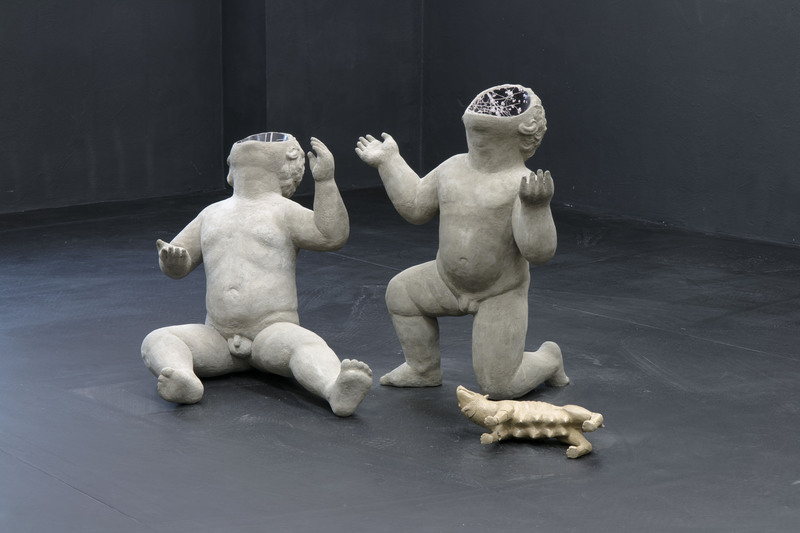 Hulačová and Takáč think in psychologizing and cosmic dimensions and thus also in their joint installation they exceed the analysis of media and the rigid reading of art history references. Their Černé světlo /Black Light is mainly a metaphorical space with a dense predecessor of networks, into which meanings are chased by using certain photographic principles. In conclusion, it’s necessary to give an affirmative response to the question from the introduction and confirm that the plastic forms ended up in a photo gallery justifiably. Photography is a strong medium for visual representation. It has helped to determine our approach to reality for almost two hundred years now and it will apparently play a role in defining our sensitivity to images even in the era of advanced multimediality. The spread of photographic thought into other fields of the creative arts is thus only a small segment of many much more important mergers and deviations that occur in human mentality, perception, imagination and social rapports thanks to the dissemination of reproductive audio-visual technologies. Today you can find photography even in places where there is no photographer, no camera and no zoom lens.